THERE are a couple of reasons why I am covering Fleetwood Mac’s Rumours. It sounds like it was a case of the band ripping up the studio and fighting but everyone knows there was a lot of disruption and arguments happening. Nicks and Buckingham were fraught and the latter wrote about Nicks in the cruel and dismissive Go Your Own Way. It would not happen today but the fact Nicks is present on the track do seems unbearably tense and unhappy. The band knew that the music was solid and golden: the personal problems were happening but they did not let it get in the way of the recording too much. Nicks did struggle to get her fantastic track, Dreams, recorded – Buckingham was exerting a lot of control and, as such, Nicks did suffer to a degree. Prior to the album being recorded, the band was subject to press intrusion and inaccurate stories. There was a lot of tabloid attention their way and the psychological impact this had in the ranks was quite pronounced. The fact they managed to get into the studio to start work on Rumours was a huge feat in itself. Rumours was a collaborative experience with a lot of terrific individual moments but Lindsay Buckingham was very much leading and guiding the sound. He wanted to create a Pop album and seemed to have a solid idea how Rumours was going to come out. In many ways, there are two sides to Rumours. There is the partying and the recklessness happening as they recorded in various studios around California. The band were taking a lot of cocaine and partying. A lot of that was done with other people as there was not a great deal of socialising away from the studio. They would often start recording at breakfast having only got a wink of sleep the night before. It seems, though, that the tensions and fallouts actually made the work shine. They seemed to create some of their best work when there were disagreements and, even though Nicks and Buckingham were divided, Buckingham had a real talent for making Nicks’ work resonate and blossom. Despite the animosity between members and a real hard time in their arc; the music one experiences on Rumours seems too good to be true. I have written about this before but how often does one hear an album like Rumours in this day and age?! Most artists/bands who are happy and focused cannot release a record half as good: Fleetwood Mac were putting down this material whilst sleep-deprived and, at times, at loggerheads. The main writers on the album – Buckingham, Christine McVie and Nicks – worked individually and there were occasions when they shared lyrics with one another. The Chain is the only song written by the entire band – a rare collaboration that stands as one of Rumours’ best moments. Although Nicks and Buckingham were balkanised and Christine McVie was having an affair during the time, a lot of the songs regarding affairs and breakups were only realised after the fact. It was rather craft that the writers were talking about these matters but in a way that did not make it apparent. Listen to the songs written by Buckingham and, for the most part, there is a more bitter and angry tone. Second Hand News, Go Your Own Way and Never Going Back Again are regretful and show a man looking for a new start. Nicks provides more hope with the gorgeous Dreams. McVie’s Songbird is one of the most beautiful songs the band ever recorded whilst McVie’s inspiring Don’t Stop urges the band/people to look forward and forget about yesterday. McVie’s You Make Loving Fun was not actually written about her husband, John (it was about a lighting engineer she was having an affair with) whilst Nicks’ Country-flavoured I Don’t Want to Know look at the end of the relationship and why it comes and goes – hard not to think about her state of affairs with Buckingham and how capricious their love was. 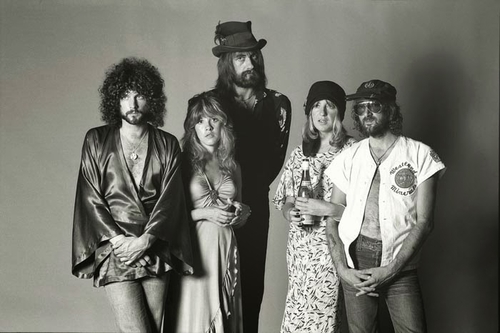 Gold Dust Woman is Nicks’ experiences in Los Angeles and her hardships there; Oh Daddy, a Christine McVie number, about Mick Fleetwood and his wife Jenny Boyd getting back together (although there are a couple of interpretations regarding the song’s origins). All of the songs hang so well as a unit – despite the fact there were three different writers (apart from The Chain). I think The Chain is the best song on the album as it is most complex and unified. Its famous bass work has been sampled and used extensively but I love how it sort of builds and builds as it goes along. The band always knew the album would be good and see the light of day and I am searching my mind and wonder whether any similar album has been recorded. There have been albums where band members have been tense and struggling – The Beatles’ Let It Be springs to mind! – but nothing where the results have been so good! In many ways, the personal crap was happening behind closed doors and, when in the studio, that negative energy was being channelled into something positive and productive. The success and sales of Rumours speak for themselves and the record hit number-one here in 1978. Mick Fleetwood called Rumours Fleetwood Mac’s most important album and it allowed the group to continue for years to come. Had there not been success and chart glory then one wonders whether they could have maintained their bond and had viability. It is hard to say whether there is one clear reason why Rumours was/is a major success. The fact the songs are likeable, personal and instantly memorable meant people were playing the album over and over. “As much feminine energy as Rumours wields, the album's magic is in its balance: male and female, British blues versus American rock'n'roll, lightness and dark, love and disgust, sorrow and elation, ballads and anthems, McVie's sweetness against Nicks' grit. They were a democratic band where each player raised the stakes of the whole. 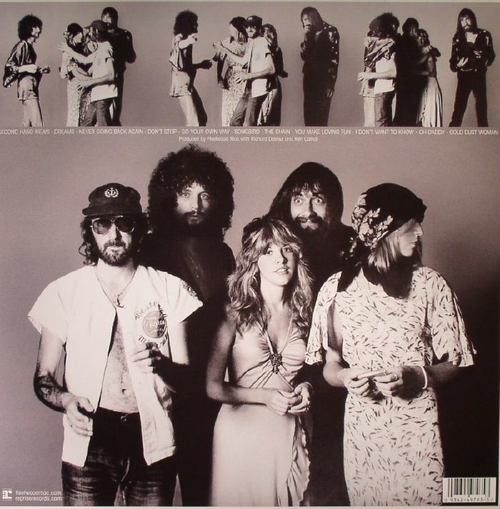 The addition of Buckingham and Nicks and McVie's new prominence kicked John McVie's bass playing loose from its blues mooring and forced him towards simpler, more buoyant pop. Fleetwood's playing itself is just godhead, with effortless little fills, light but thunderous, and his placement impeccable throughout. The ominous, insistent kick on the first half on "The Chain", for example, colors the song as much as the quiver of disgust in Buckingham's voice when he spits "never." Nevertheless, it is difficult not to buy into the mythology of Rumoursboth as an album and pop culture artifact: a flawless record pulled from the wreckage of real lives. As one of classic rock's foundational albums, it holds up better than any other commercial smash of that ilk (Hotel California, certainly). We can now use it as a kind of nostalgic benchmark-- that they don't make groups like that anymore, that there is no rock band so palatable that it could be the best-selling album in the U.S. for 31 weeks. Things work differently now. Examined from that angle, Rumours was not exactly a game changer, it was merely perfect”. “Touring for Fleetwood Mac by now meant private jets and all manner of preposterous demands. Hotels would be told to paint rooms pink and install grand pianos. White, like the one on the cover of Imagine, of course. If they couldn’t be manoeuvred through the door, they had to be winched through the windows. “Coming off an album as successful as that, we were being asked to get on this treadmill of clichéd thought and hash out the same thing again,” recalls Buckingham. “Punk and new wave had kicked in during the meantime and, although I wasn’t directly influenced by that music, it gave me a kick in the pants in terms of having the courage to try to shake things up a little bit. I wanted something that had a little more depth”.